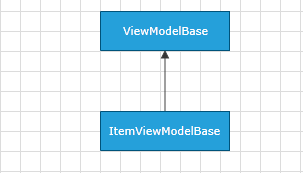 This article describes the ItemViewModelBase class defined in the Diagramming Extensions. The ItemViewModelBase class is designed to serve as a base ViewModel that can describe any RadDiagramItem. It implements the ViewModelBase class. ItemViewModelBase exposes one constructor - ItemViewModelBase() that initializes a new instance of the class. Visibility Gets or sets the Visibility of an item. It is of type Visibility. Position Gets or sets the coordinates of a Point that represents the position of an item on the diagramming surface. Content Gets or sets an object that represents the content of an item. IsSelected Gets or sets a Boolean value indicating whether an item is selected.